Leidse Square (‘Leidseplein’ in Dutch) is one of the most popular places in Amsterdam for going out. It’s a square in the centre of Amsterdam with hotels, terraces, bars, party cafe’s, restaurants, coffeeshops, cinemas, theatres, a casino and dance clubs. 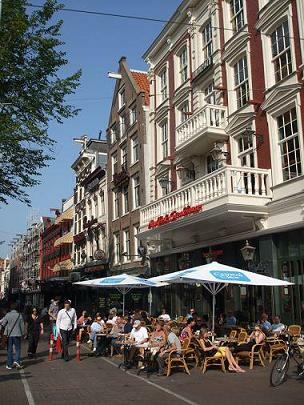 Leidse Square is in Amsterdam center near the Rijksmuseum and Van Gogh Museum (10-15 minutes walking). Several trams lines (such as number 1,2 and 5) take you directly to the Leidse Square. From Central Station to Leidse Square is about 40 minutes walk. It’s about 25 minutes walking from Leidse Square to Dam Square. 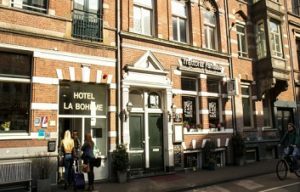 Two star Hotel La Bohème is housed in the Marnixstraat only 160 metres from Leidseplein. The 18 guest rooms have a private or shared bathroom. Free wifi and breakfast included. More than 1361 reviews (8.6). 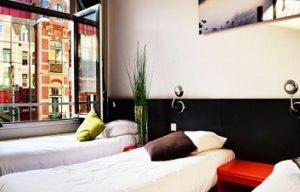 A few other discount hotels nearby are Hotel Freeland (1045 reviews, 7.9), Titus City Centre (1018 reviews, 7.0), Boutique Hotel View (917 reviews, 8.2) and Quentin Amsterdam Hotel (3464 reviews, 6.4). 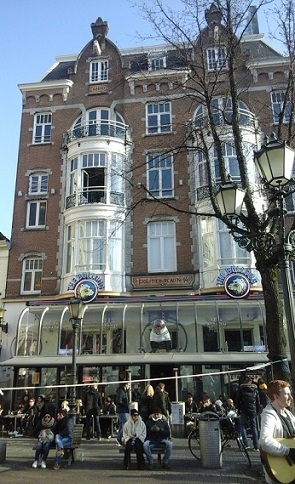 Hampshire Hotel – Amsterdam American is located on the corner of Leidse Square. The hotel is build in Art Deco style. 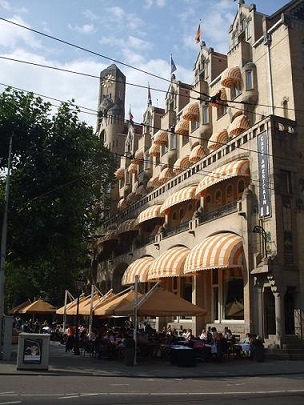 Trams to Central Station, Dam Square and the museums stop right across from the hotel. Walking to the Rijksmuseum, Van Gogh Museum and casino is 10 minutes. More than 3470 reviews (8.3). Across the American Hotel is 5-star Marriott Hotel (1388 reviews, 8.0) and 4-star NH Amsterdam Centre (1075 reviews, 7.8).